A pizza with a chicken breast and zucchini base? Oh yes…Chicken breasts, indeed! It’s nourishing, it can be prepared in no time and solves a meal in a delicious way. Bingo! Those “nice” 🙄 Low-carb days, which are fortunately few and far between, are those in which I paradoxically enjoy to create and experiment more in the kitchen. I like to try new combinations to overcome the last days before reloading. There are endless possibilities to be creative, you just need to have time … mmmm time … its fast and merciless flow is the issue for everyone. This is precisely why I avoid getting myself into complex preparations, firstly because I have little time myself and I imagine it’s the same for everyone, secondly because I’m definitely not a chef, who does it for a living… I need to eat as soon as I get back from the gym… or I’ll go through the whole fridge! The recipe today is far beyond simple, requires a little craftiness to roll out the dough, like a real pizza, and you’re done. It doesn’t contain cereals, it’s not a real pizza, but it meets my needs when I want something different from the usual grilled chicken that haunts my diet regime. Since the base does not have a real crust, I use roasted broccoli to give this pizza its crunch. 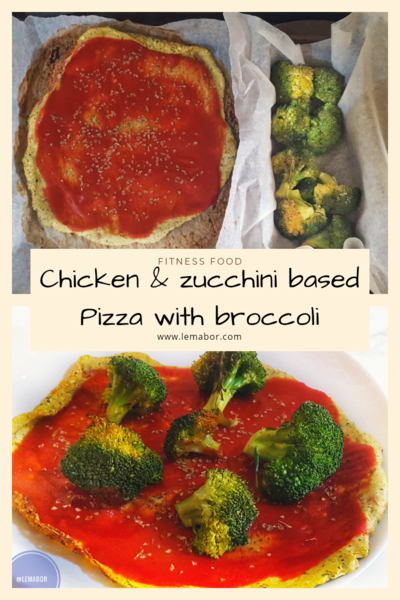 In order to make this chicken and broccoli pizza, I spent* € 4.15 per portion, which is also quite cheap. Products availability: Everything is easily found at the supermarket, the availability is excellent. The first time I tried to make this pizza I made a lot of mistakes. The issues concerns the thickness of the base. If it’s too thin, it dries out, if it’s too thick it gets a bit stringy. I spread the dough until roughly a couple of mm thick. So the first attempts can be hit and miss, if it doesn’t work out first go, don’t give up and try again. This recipe is prepared in 25 minutes in the oven. Grind the chicken breasts with the food processor and put them in a mixing bowl. Rinse and grind the zucchini and add them to the mixing bowl along with the chicken breasts. 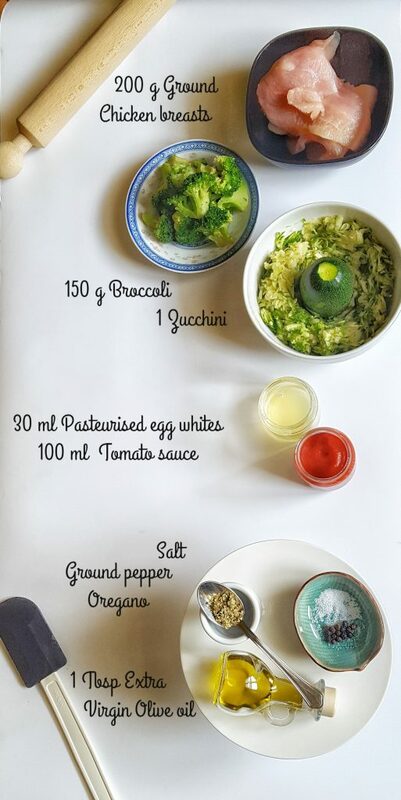 Pour the pasteurised egg whites in the bowl, add salt and ground pepper and mix evenly. Rinse the broccoli and cut off only the florets and set them aside. Line a pizza tin, or oven tray, with baking paper and scrape the “dough” out and out it in the middle of the tin/tray. 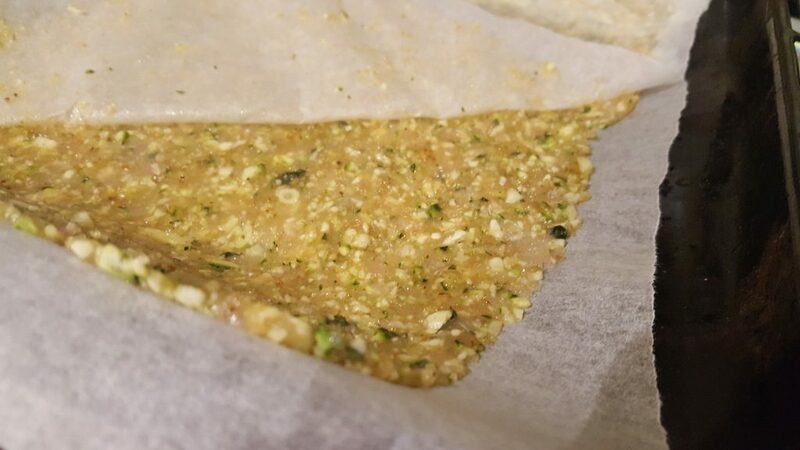 Remove the top sheet and bake at 200°C for 10 minutes, put the broccoli inside to bake with the pizza. 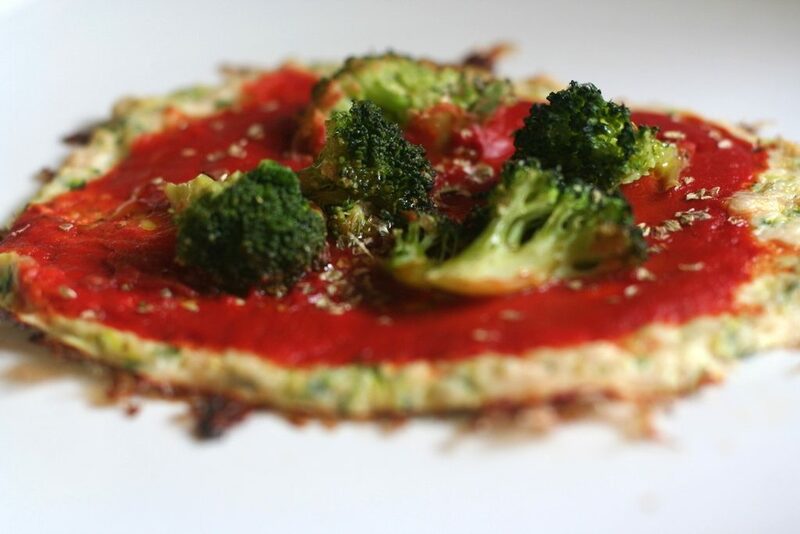 After 10 minutes remove the pizza and spread the tomato sauce and oregano on top, meanwhile turn the broccoli and check to see if they’re done . Put it back in the oven and cook for another 10 minutes, make sure the broccoli don’t burn. 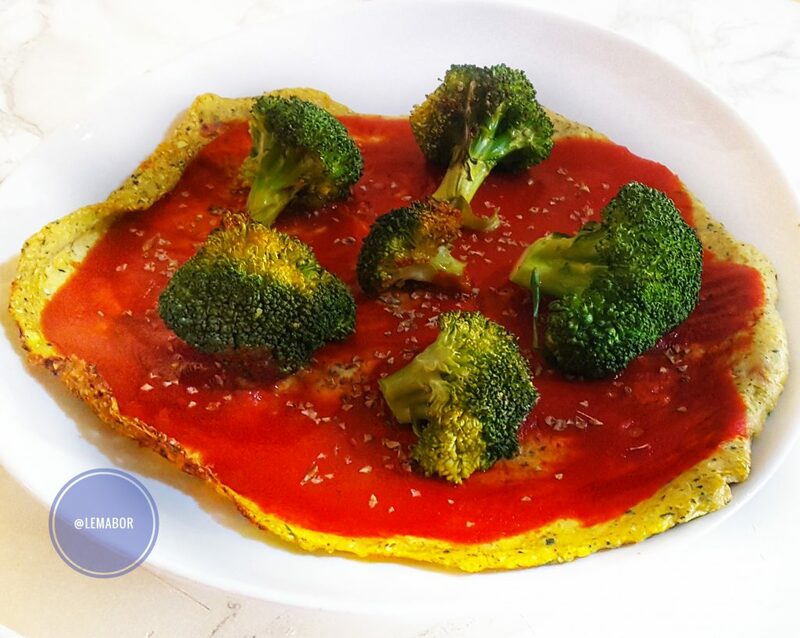 Remove from the oven, add the broccoli and top it off with a drizzle of extra virgin olive oil. Pizza and Chicken...what a combo. Line a pizza tin, or oven tray, with baking paper and scrape the "dough" out and out it in the middle of the tin/tray. 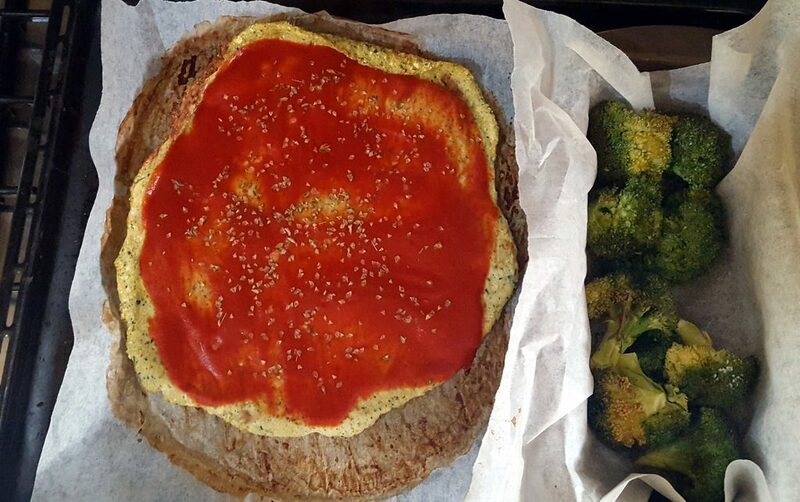 After 10 minutes remove the pizza and spread the tomato sauce and oregano on top, meanwhile turn the broccoli and check to see if they're done . Put it back in the oven and cook for another 10 minutes, make sure the broccoli don't burn.